In collaboration with the Arts and Humanities festival at King’s College, London, fittingly unravelling the theme of the ‘Underground’, Modern Moves is presenting a range of research that engages with various underground activities to suit the palate of all. Join us for our October events engaging mind and body to rethink the dance floor, DJs and diaspora! 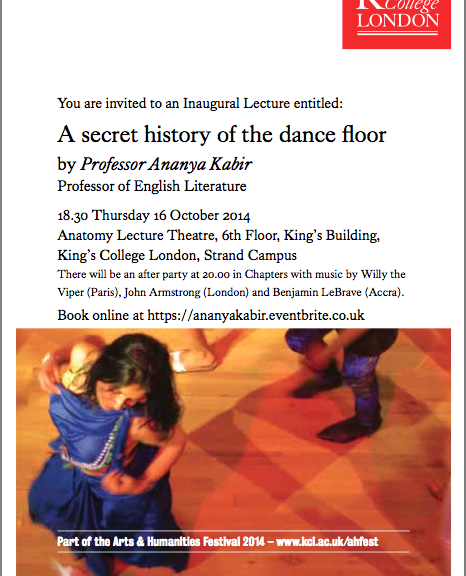 Modern Moves’ Professor Ananya Kabir will start with a delicious discussion of the magic of the dance floor and its secret history – from drum circles and sugar plantations through to Paris Noir and New York’s Jazz Age and the global emergence of clubs. Finished off by the dance floor itself and the international DJs Wilfrid Vertueux (DJ Willy the Viper, Paris), Benjamin LeBrave (Akwaaba Records, Accra), and John Armstrong (London), with MM rhythms of the Latin, Afro-Electronic, and tropical sounds. Why would we NOT love this?! Madison Moore follows on Friday taking us into private liaison between DJs and dance floor. Hosting a discussion with Thursday night’s DJs Wilfrid Vertueux (DJ Willy the Viper) (Latin music), Benjamin Lebrave (African) and John Armstrong (“world beat” music), Madison will weave out a sonic narrative between moving bodies on the dance floor. To finish off, Saturday rounds up the Underground sessions with Kwenda Lima‘s Kaizen workshop, a day dedicated to a dance form unified of West African bodily moves with philosophical approaches drawn from Indic and Buddhist thought, led by live percussion. A touching and stimulating dance form emphasising the mind-body connection. Certain to be a stimulation to the open mind! 18th October, 11 am onwards. And finally, the following Tuesday, Modern Moves’ advisory board member Frederick Moehn takes us on a tour of Brazilian music from underground to pop. Exploring a long historical journey of music, race, rhythm and the popular, Frederick will look at musical forms that are refractions of European contact with African populations and cultures in the New World, that move from the underground to the foreground, from the underclass to the creative class, from the counter-cultural to the Pop. Exciting! The concert will include vocal pieces from the colonial era as well as from more recent genres. Join Modern Moves for a stimulating and nutritious season of Underground moves!